Thank you all for the support we received after the last update on the health study, it was very useful at the last Health Study Group (HSG) meeting. Also please watch for the upcoming PPA candidates forum. I was concerned going into the last HSG meeting because the County's draft health study request for proposals (RFP) failed to follow the Health Study Group and community recommendations. However, at the last meeting, the County of Hawai`i and Dr. Maddock agreed to revise the RFP to better reflect the recommendations of the community based health study group. The revised draft Hawaii County Geothermal Health Study RFP has now been completed by Dr. Maddock. PPA wants to say mahalo to Dr Maddock and the County for being reasonable and responsive to community concerns about our health study. The new draft RFP, while not perfect or public yet, appears to incorporate into the proposal more of the work the study group did. We appreciate the special effort of those who were able to contact the mayor about this last time on such short notice: it was noted by the mayor's office and is reflected in the new draft RFP. Thank you. On the surface and for the most part it seems they have tried to follow the recommendations of the study group report this time. There are still some ongoing issues that need to be resolved though. The health study group will meet again this Thursday to work through those and to help prepare a final draft for public scrutiny, suggestions, and comments, as I understand it, before the RFP is put out for bids. Local politics can be frustrating to us all at times. Who we elect is very important to what happens in Puna and Hawaii over the next 2 years ... Simply put, if we want better representation we need to elect representatives that will work with us, not above us. To achieve that, we need to participate in the process ... We need to vote... At the local level particularly, we can make a difference. You can help -- vote. It is nice to see we have choices for the Puna offices of council districts 4 and 5 as well as state house seat 4. We need to put people in office here that actually listen to us when we testify before them, and who are responsive to our concerns. If we want change, now is our chance. It will be a long 2 years before we get another one, please register and then vote. Who we elect affects our ability to get meaningful legislation and laws passed. PPA humbly asks you to get to know the candidates as much as possible, help us elect responsive representatives. Take some time to get to know the people who want to represent you. To help, PPA will be hosting a candidates forum. Saturday, July 26, 2014, from 4:00 to 7:00 p.m.
We realize the forum is very close to the primary election and after early voting has begun. We decided to do this because it will probably be your last chance before the primary election to see and speak with the candidates in this kind of setting. Please remember early voting starts July 21, five days before this forum. If you are not sure who best represents you, or have any remaining questions please come to our forum and get to know the people that want to represent you. We all get better representative government by voting for who we believe will best represent our interest. The format for the forum will be a brief introduction by Harry Kim to be followed by candidate presentations and moderated questions on issues facing Hawaii County and Puna. 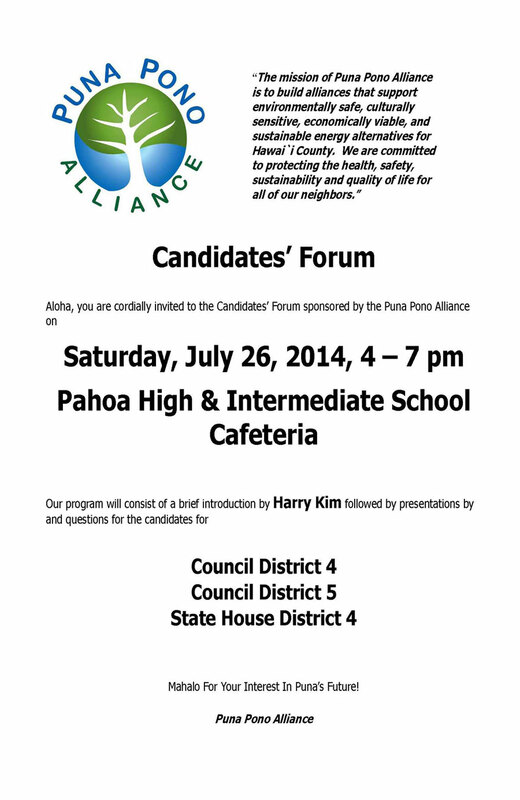 Mahalo for your interest in Puna's future, and Puna Pono Alliance. UH Hilo Science and Tech Bldg.